Please email, phone or text an order through. My suckling pigs are all processed in the correct manner both tagged and stamped. Transported in refrigerated trucks to your chosen Butcher shop,restaurant or collect from our Farm gate Shop in the Yarra Valley. 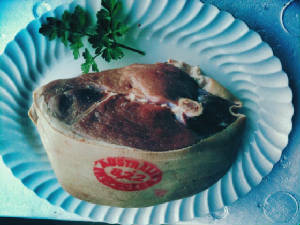 The pigs are sold as a whole piece, including the head. They are dressed (hair & insides removed) and ready for spit roasting! Restaurants will have their suckling pigs delivered buy a refrigerated van. If you are a private buyer a deposit is required upon ordering and balance may be paid apon pick up, or upon delivery booking. Pick up is required from our butcher shop or you may choose delivery to your door for $45.00 . Suckling Pig Prices Vary With Season & Stock 8-20kg pig Price Range $190-260. For current prices please email yarrapigs@live.com.au with the weight required. I sell my pork via my FACEBOOK PAGE YarraPigs Free Range Pork or from our Farm gate store "Yarra Valley Custom Meats" in Dixons Creek. I sell it mainly in cryovacc packs, but freezer bags are a cheaper option. The pork is sold fresh or Frozen. Cuts available : Pork Chops, Cutlets, Roasts, Spare Ribs, Pork Belly, Pork Racks, Kidneys, Trotter & Hocks.